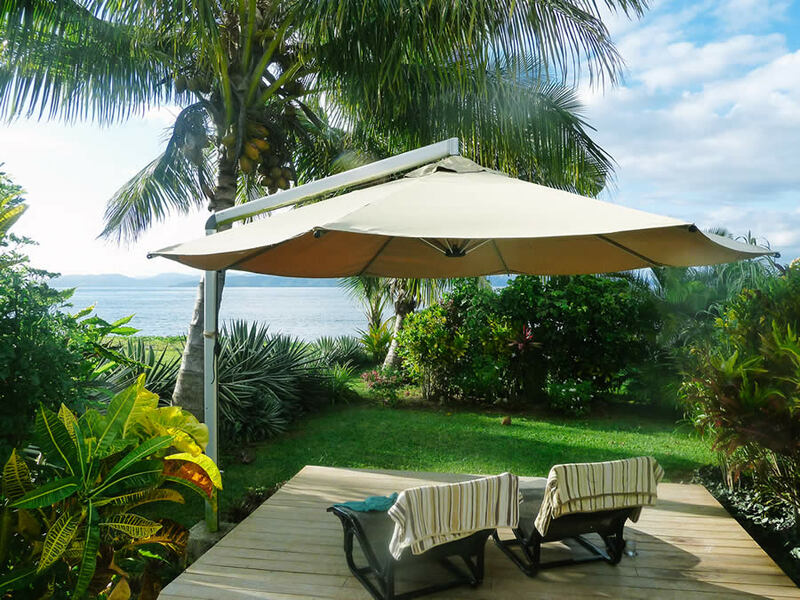 Aroha Taveuni Resort accommodation consists of two standalone bures, one with two separate rooms, and one with three rooms, two of these rooms can be used as a family unit, or two separate rooms with a studio room in the middle. Each room has its own bathroom and outdoor shower with hot water. The bures are only meters from the beach front and waters edge, so you can lie in bed at night and listen to the gentle lapping of the water. Each room has a king size bed, or two king singles if required. The rooms have both air conditioning and fan cooling with wooden louver windows with insect mesh covering to let the nice cool evening breeze flow through. The huge outdoor showers adjoining each room are a treat to take a long cool shower in and watch the coconut trees sway in the breeze or simply sit on the shower seat and star gaze to your hearts content. The beautiful 10 meter infinity pool and sun deck adjoining the main house are available for guests to relax and use. Our restaurant Kai Time is open for breakfast, lunch and dinner.